If you’ve ever wondered how quickly an alien army like the one in Independence Day could subdue humanity, worry no more. 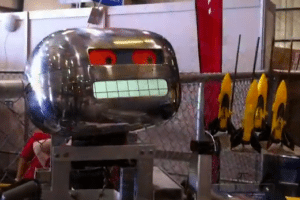 From the ingenuity on display at Maker Faire, it’s pretty clear that we’d be saved by the large and growing corps of civilian tinkerers, who could probably take down a space cruiser using nothing more than duct tape, a Roomba, an Arduino board, and a few LED lights. This year’s Maker Faire Bay Area happened May 19 and 20 (and was preceded by a special Education Day on May 17). I spent Saturday afternoon wandering the event enormous expo halls at the San Mateo Event Center, home to the Faire since its inception in 2006, and used iMovie on my iPhone to hack together the short video below, showing everything from a Lego train set to NASA Ames Research Center’s “Phonesats” (microsatellites powered by Android phones). It would be fruitless to ask whether Maker Faire is the product of the massive maker movement blossoming in the U.S.—with thousands of people taking up soldering irons and building their own fire-breathing robots and remote-controlled spy planes—or the stimulus behind this movement. It’s clearly both. Though the event is a Bay Area creation, it has since spawned clones in Detroit, New York, and—for the first time this summer—Kansas City, MO. Community-run “mini maker faires” have also sprung up in cities from Atlanta to Vancouver. While the tech-media spotlight seems stuck on stories like the Facebook IPO, the Faire was a great reminder that real innovation starts in the nation’s garages and dorm rooms.